Ontario was once considered one of the worst jurisdictions in the world for wolf management. Wolves were treated as vermin, and were managed without regard for their ecological value or for animal welfare in general. In fact, wolves were under bounty by the Ontario Government for almost two hundred years and staff in provincial parks were required to kill wolves as part of their duties. Interest in wolf research increased in the 1950s, and Dr. Doug Pimlott initiated a study in Algonquin Provincial Park that banned wolf culling within the park for several years. Finally, in 1972, the wolf bounty was rescinded province-wide as knowledge of wolves and their important role as apex predators grew. The extent of public interest in wolves was not discovered until 1968 when the first Public Wolf Howl in Algonquin Provincial Park attracted almost 600 visitors, stunning park staff. The program has never lost momentum and continues to educate the interested public as new research uncovers more and more about Algonquin’s eastern wolves. Earthroots opened the Wolves Ontario campaign in 2000 in response to the horrendous mismanagement of wolves in our province. Click here to read the Earthroots’ 2002 report Ontario Wolves Under Threat: The Call for a Provincial Wolf Protection Plan. Despite the public’s interest in wolves as icons of Canadian wilderness, wolves continue to be heavily hunted and trapped. Prior to the 2005 release of the Strategy for Wolf Conservation in Ontario by the Ontario Ministry of Natural Resources and Forestry, wolves could be hunted and trapped year round without bag limits and wolf population numbers used by biologists to evaluate whether the population was healthy were based on rough 40-year old estimations. In 1998, then Minister of Natural Resources John Snobelen appointed the Algonquin Wolf Advisory Group (AWAG) to recommend a long term Adaptive Management Plan for the wolves with the goal of reducing human-caused wolf mortality. On January 15th 2001, the committee’s recommendations were posted to the electronic Environmental Bill of Rights registry for a two-month public comment period. The central and most contested feature of the report was the suggestion to merely limit the hunting and trapping season in 37 townships surrounding the park. A full year round closure on hunting and trapping wolves was only recommended for 4 of the 37 townships. These townships: Finlayson, McClintock, Livingstone and Airy border the south gate of the park. Killing the wolves within these townships would affect the success of the popular public wolf howl. On November 6th, 2001, Snobelen announced a 30-month moratorium on the hunting and trapping of wolves in the 39 townships immediately surrounding Algonquin Provincial Park. This came after over a year of campaigning by Earthroots’ Wolves Ontario! Project. Earthroots continued to campaign for further improvements in wolf conservation and with the support of over 10,000 public comments in favour of wolf protection around Algonquin, the minister permanently banned all harvesting of coyotes and wolves in the 39 townships surrounding the park. Note that this ban still allows landowners to harass, capture or kill wolves or coyotes in protection of their property and farm animals. Following the release of a seminal paper that identified the unique genetic nature of eastern wolves, the federal Committee on the Status of Endangered Wildlife in Canada (COSEWIC) assessed the eastern wolf as a grey wolf subspecies of ‘Special Concern’ in 2001 because of characteristics that make it particularly sensitive to human activity or natural events. 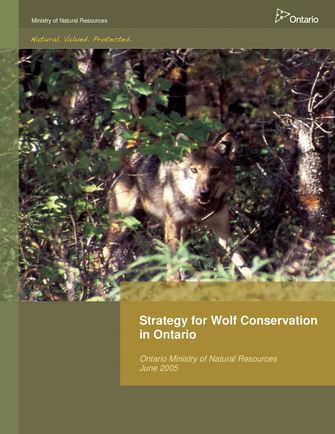 It was not until 2004 that Ontario’s provincial equivalent of COSEWIC, the Committee on the Status of Species at Risk in Ontario (COSSARO) matched this assessment and placed eastern wolves on the provincial Species at Risk List. Eastern wolves are only now considered a unique species following numerous studies published in Canada that identify them not as a subspecies of the grey wolf, but as a genetically unique animal that deserves improved protection. COSEWIC and COSSARO reviewed the eastern wolf as a unique species in 2015. COSSARO renamed the wolves “Algonquin wolves” and recommended them for listing as Threatened species, which was completed by the Ministry of Natural Resources and Forestry on June 15th 2016. COSEWIC assessed Eastern wolves as Threatened species, and their recommendation is still being reviewed by Environment and Climate Change Canada. Read more about Ontario’s flawed interim strategy for “Algonquin wolves” here. While protection for eastern wolves improved significantly, this was not the case for grey wolves in our province. It was not until the release of the first-ever provincial wolf strategy that built upon commitments by the provincial government that wolves could no longer be hunted or trapped between April 1st and September 14th in “core wolf range” (northern and central Ontario). This hunting and trapping season closure in northern regions will help protect wolves during the months when they are raising vulnerable wolf pups. However, most wolf hunting and trapping occurs over the late fall and winter when the wolf’s pelt is prime. Moreover, resident and non-resident hunters are restricted to killing only two wolves per season. The seals for residents cost only $10.93 whereas seals for non-residents cost $269.58. Earthroots hopes the higher cost to non-residents will limit trophy hunting of Canadian wolves by American and other out-of-province hunters. However, many outfitters in northern Ontario advertise wolf hunting to American hunters. Sadly, trappers can still kill as many wolves as they want. There are 8500 trappers and more than 2800 registered traplines on crown land in Ontario. Trapping wolves on private land is permitted in core wolf range and beyond. 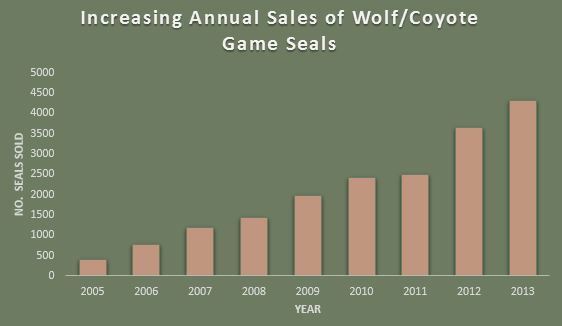 Provincial trapping numbers are approximately 500 wolves/season but are underestimated since trappers are only required to report wolves killed if their pelts will be sold commercially. It is also mandatory to report all wolves killed regardless of the method and reason in central and northern Ontario. Based on research conducted by provincial biologists, the wolf harvest is estimated at up to 27% of the entire wolf population in certain areas of high accessibility and high hunter/trapper density. East of the Algonquin Park harvest buffer zone, where eastern wolves are known to migrate, wolf and coyote harvest has been estimated at 24%. It is clear that harvesting wolves and coyotes is limiting the expansion of the eastern wolf, and likely unsustainable in general. Algonquin Provincial Park marks an approximate boundary between management regimes in “core wolf range” and the largely unregulated wolf and coyote killing in southern Ontario. South of “core wolf range”, wolves and coyotes can be killed year-round without bag limits by both hunters and trappers, and unlike mandatory reporting in “core wolf range”, numbers are not required to be reported to the Wildlife Branch of the Ministry of Natural Resources and Forestry. The reasoning? Most canids in southern Ontario are coyotes, and the government has made no commitment to conserve these essential top predators. This lax management of wolves and coyotes flies in the face of research conducted by provincial biologists that describes the range of eastern wolves south of Algonquin Park. Studies show that eastern wolves are more susceptible hunting and trapping compared to other canids, and are therefore particularly sensitive in unprotected habitat. 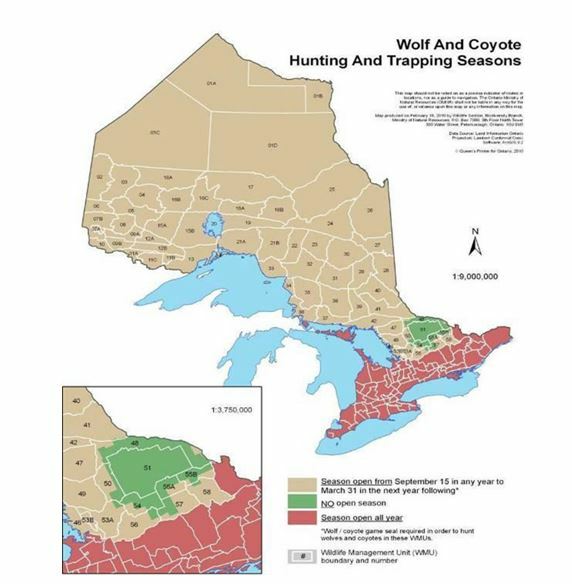 Provincial coyote and wolf harvests south of Algonquin’s protection area are estimated at 24% of the population. Eastern wolves migrating out of Algonquin Provincial Park into their historic range are therefore sacrificed to hunters or trappers operating there. Moreover, hybridization between eastern wolves and coyotes threatens the eastern wolf population. Protecting from harvesting leads to less hybridization. Research show that without more protection, it is almost impossible that the wolf population will recover. Eastern wolf researchers estimate that this small population falls below the accepted critical size to ensure even short-term persistence. Unfortunately, there is a distinct knowledge gap with respect to the distribution of eastern wolves in Ontario, and management should be planned according to the precautionary principle – conserving rather than risking more wolves. If eastern wolves are not protected in southern Ontario, it is improbable that they will be able to successfully migrate and establish a healthy population in lands that have been without wolves for several decades, including the Adirondack area of New York. * Eastern wolves and eastern coyotes can be physically indistinguishable. In order to prevent accidental killing of eastern wolves, coyote protection must also be enforced. There are no certified humane traps for killing wolves in Canada! Canada signed the Agreement on the International Humane Trapping Standards (AIHTS) to avoid a fur import ban threatened by the European nations. AIHTS outlines a trap testing and certification process to be followed to ensure more humane trapping standards. However, there has been no certification initiative for wolf leg-hold traps. Killing snares, the most commonly used wolf trap, are not regulated under AIHTS because they are homemade. Therefore, there is no way for wolves to be killed in a way considered humane under this international agreement. Read research published in 2015 by biologists Proulx et al. about the cruelty of snaring here. Click here to help ban wolf snaring in Ontario! Wolves are only protected from hunting and trapping less than 5% of their total range!